I'm back! It has been a busy past few weeks. My sister got married last weekend so we have been trying to recover from a weekend of missed naps, dancing, family time and celebrating. In addition to our normal weekly routine, religious education started at our church last week. This is my 5th year teaching 1st grade in the after school program. This is the 4th year that my mom and I have co-taught. We started this when I was pregnant with K and it has worked out great, so we keep doing it every year. 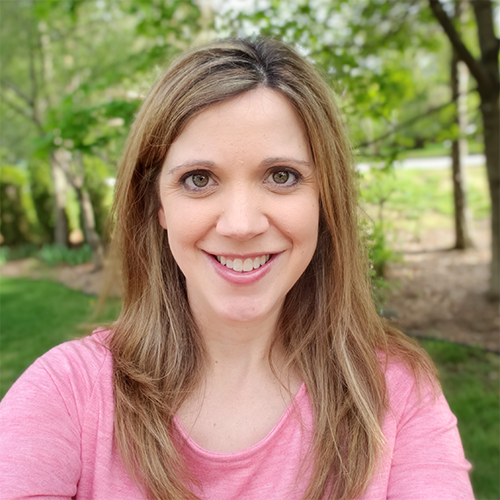 It seems kind of crazy that it doesn't start until October, but it is actually really nice that you can get into your back to school routine before you add additional teaching responsibilities to the mix. 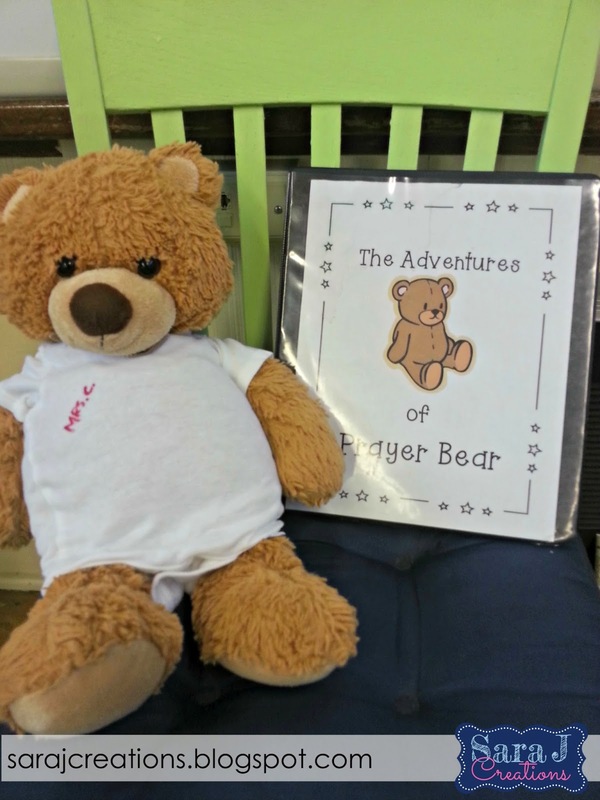 Another way to get our little ones excited about praying in their daily life, is to use Prayer Bear. After the directions, we include some examples of what to do with Prayer Bear. 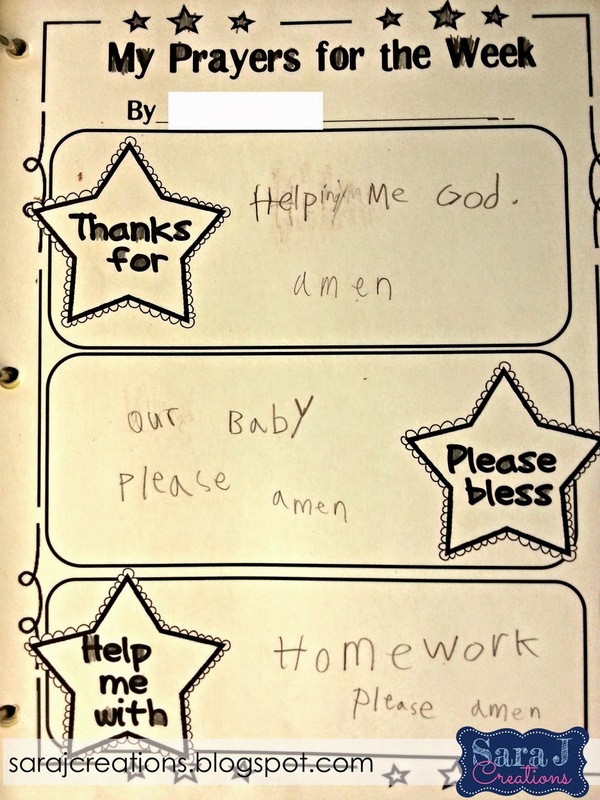 We find this to be helpful especially at the beginning of the year when our firsties don't know many prayers or many different ways to pray. I also put printed copies of some different prayers that they can use. I like THIS free book of prayers from Jennifer James. Then we have a different tab for each student. 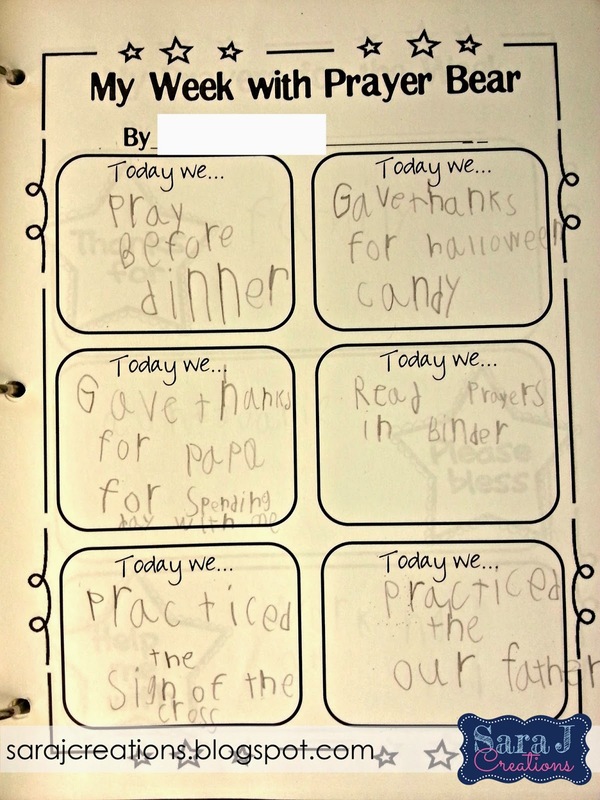 Behind each tab are two different sheets that the students write or draw on that describe what they do with Prayer Bear each day and what they prayed for during the week. This seemed to be much more successful than having no prompt. 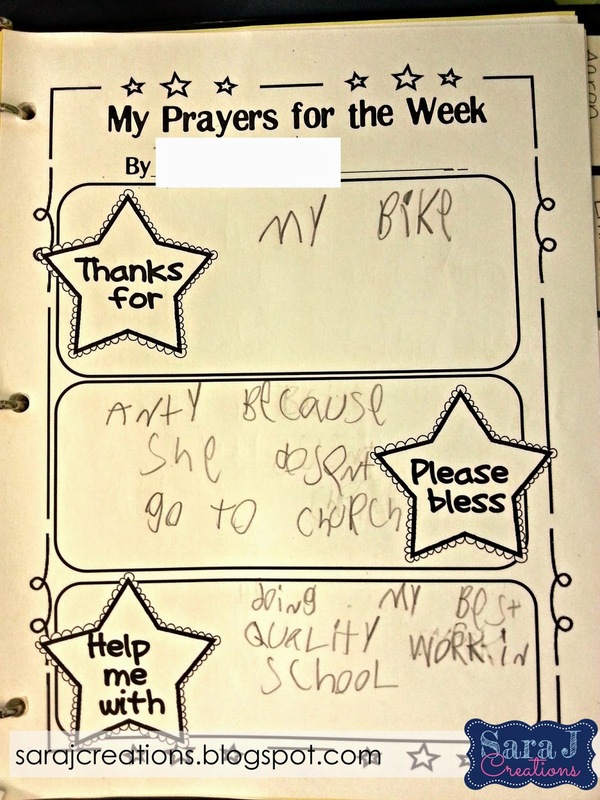 The first few years we did this, we just gave them a notebook with my examples in it and they just wrote what they did with Prayer Bear. When it was that open ended, we got a lot more off topic responses like he went to my soccer game or we played video games together. When they have to fill out the sheets, it brings the focus back to prayer. When the students bring Prayer Bear back the following week, they share with the class what they did with Prayer Bear. They also add their name to Prayer Bear's shirt once he has visited their house. The kids seem to love it and we've gotten great feedback from parents. This is the first year since we started doing this 5 years ago that a parent has expressed concern over the spreading of germs via Prayer Bear. We did some thinking and made a few adjustments. We moved Prayer Bear to a plastic backpack (from a cloth one) so it could be more easily wiped down. We also asked that students NOT sleep with Prayer Bear. We also assured parents that we wash him during all breaks and gave them permission to wash him while he is at their house. We also gave them the option to skip having Prayer Bear visit if they are concerned about germs. Hopefully this will help with any families who are concerned about germs. 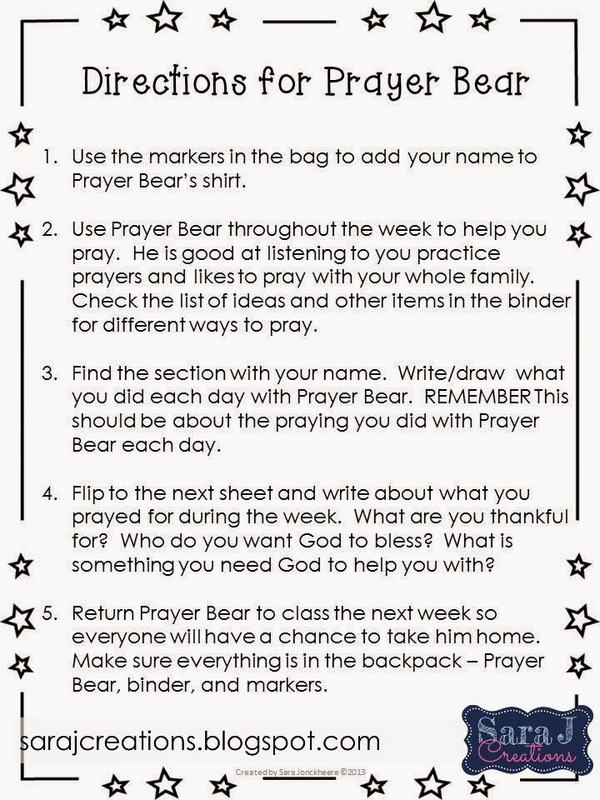 If you are interested in starting a Prayer Bear in your classroom, click below, enter your information and the pages we include in our binder (cover, directions, ideas, prayer pages) will be emailed directly to you. This is a great idea. I love it. Thank you so much for offering it free so I won't have to make any on my own. :)I am going to incorporate this into the three year old program and in hopes all the other teachers join me. Many Blessings. You're welcome! I'm glad you can use it and hope you students love it as much as mine. I love this idea! My first graders are going to be so excited! Thank you for sharing! You're welcome! Thanks for leaving a comment. Hope your first graders love it like mine do. You're welcome! I'm so glad you love it and appreciate you sharing it out! This is genius! I just love this idea! I'm am going to use it in my preschool sunday school class starting this weekend! Thank you for the free print outs! I am thrilled, I know this will be a hit with the kids and will really help them learn to pray and how and why! Amazing idea! I'm so glad you like it! You are so welcome. My class loves it every year.